At the end of the dot-com boom in the 1990s, many governments had already committed to creating portal sites for their citizens. These included primary portals to the governments as well as portals developed for specific audiences. Cultural portal aggregate digitised cultural collections of galleries, libraries, archives and museums. This type of portal provides a point of access to invisible web cultural content that may not be indexed by standard search engines. Digitised collections can include books, artworks, photography, journals, newspapers, music, sound recordings, film, maps, diaries and letters, and archived websites as well as the descriptive metadata associated with each type of cultural work. These portals are usually based around a specific national or regional groupings of institutions. Corporate intranets became common during the 1990s. As intranets grew in size and complexity, webmasters were faced with increasing content and user management challenges. A consolidated view of company information was judged insufficient; users wanted personalization and customization. Webmasters, if skilled enough, were able to offer some capabilities, but for the most part ended up driving users away from using the intranet. Many companies began to offer tools to help webmasters manage their data, applications and information more easily, and through personalized views. Portal solutions can also include workflow management, collaboration between work groups, and policy-managed content publication. Most can allow internal and external access to specific corporate information using secure authentication or single sign-on. JSR168 Standards emerged around 2001. Java Specification Request (JSR) 168 standards allow the interoperability of portlets across different portal platforms. These standards allow portal developers, administrators and consumers to integrate standards-based portals and portlets across a variety of vendor solutions. The concept of content aggregation seems to still gain momentum and portal solution will likely continue to evolve significantly over the next few years. The Gartner Group predicts generation 8 portals to expand on the Business Mashups concept of delivering a variety of information, tools, applications and access points through a single mechanism. With the increase in user generated content, disparate data silos, and file formats, information architects and taxonomist will be required to allow users the ability to tag (classify) the data. This will ultimately cause a ripple effect where users will also be generating ad hoc navigation and information flows. 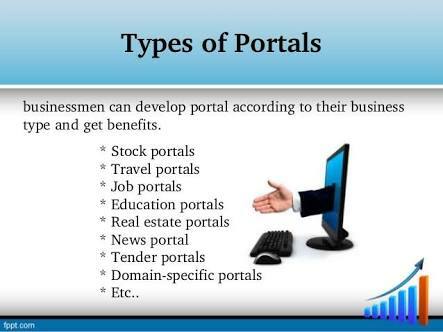 Corporate Portals also offer customers & employees self-service opportunities. Search portals aggregate results from several search engines into one page. You can find search portals specialized in a product, for example property search portals. Property search portals aggregate data about properties for sale by real estate agents. Hosted web portals gained popularity and a number of companies began offering them as a hosted service. 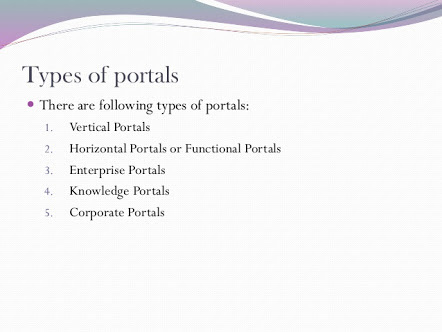 The hosted portal market fundamentally changed the composition of portals. In many ways they served simply as a tool for publishing information instead of the loftier goals of integrating legacy applications or presenting correlated data from distributed databases. The early hosted portal companies such as Hyperoffice.com or the now defunct InternetPortal.com focused on collaboration and scheduling in addition to the distribution of corporate data. As hosted web portals have risen in popularity their feature set has grown to include hosted databases, document management, email, discussion forums and more. Hosted portals automatically personalize the content generated from their modules to provide a personalized experience to their users. In this regard they have remained true to the original goals of the earlier corporate web portals. Emerging new classes of internet portals called Cloud Portals are showcasing the power of API (Application Programming Interface) rich software systems leveraging SOA (service-oriented architecture, web services, and custom data exchange) to accommodate machine to machine interaction creating a more fluid user experience for connecting users spanning multiple domains during a given “session”. Leading cloud portals like Nubifer Cloud Portal showcase what is possible using Enterprise Mashup and Web Service integration approaches to building cloud portals.